The man with the beard... No, that's not John Watson we are talking about, the Ulsterman who became beardless when he lost his bet with Roger Penske by winning the 1976 Austrian GP. Of course, Harald Ertl is the subject of our story, as F1's answer to ZZ Top has yet to find his equal in Grand Prix's facial hair department. Although he was an F1 regular for most of the latter part of the seventies and a bloody good touring car driver as well, Ertl's claim to fame comes from being "the other Austrian" involved in Lauda's Nürburgring inferno of 1976. Ertl had already been lapped on the second of the 'Ring monster-size laps when suddenly Lauda's Ferrari snapped away at the front after diving into Bergwerk. The car flew off-track and was flung back on it after its left-side tyres were snapped away by the trees at the side of the track. After a number of pirouettes it came to rest, only to be hit violently by Brett Lunger's Surtees. By then the Ferrari was already engulfed in flames - the fuel tank had burst when the 312T2 hit the Bergwerk banking. Ertl was the first to arrive and managed to swerve around the wreck, only to end up on the grass. Having seen the drama in his rear-view mirrors, Harald got out immediately and ran back to the scene. Together with Lunger, his arriving team mate Guy Edwards and Arturo Merzario - another backmarker blocked by the blaze - Ertl dived into the flames to try and rescue the World Champion. The foursome needed to hurry since Lauda's helmet had been ripped away in the impact and his facial burns were getting worse every second. There was panic when Niki's belt lock appeared to be jammed. Then Edwards put his own life in jeopardy by trying again, and was relieved to feel the lock come free. With joined forces they pulled the Austrian out of the cockpit - Lauda was saved. Lauda's dramatic accident and his amazing rescue must have given Ertl a bigger adrenaline buzz than his 8th place finish at the same track on his 1975 debut in the Warsteiner-backed Hesketh or, for that matter, any other sporting act during his five-year Grand Prix career. As far as his F1 record is concerned, three abysmal years with a Hesketh team very much on the decline made him into the Piercarlo Ghinzani of the seventies. Backed by faithful sponsor Sachs, he never once complained and remained a popular figure in the paddock throughout his days in F1. Ertl was essentially a motoring journalist and wanted to live the experience in order to report on it. That isn't to say he was just your average gentleman racer. In touring cars he was a force to be reckoned with: before his rise to F1 he was a winner in the European Touring Car Championship, sharing a BMW with Derek Bell, and when F1 had no place for him anymore he turned to the German Group 5 muscle cars, having two-timed in the German touring car series during his years with Hesketh. Driving for BMW and Ford, he was a front-runner throughout, until he sadly joined the group of Grand Prix drivers being killed in flying accidents. Ironically, Ertl's last GP weekend was held shortly after Patrick Depailler seriously injured himself in a hanggliding accident. In 1982, Ertl would die after crashing a light aircraft. Although seriously injured, his wife and son lived to tell what happened. Harald, however, perished. Ertl's premature death followed almost two years after his last GP outing, which just as his one-before-last outing was for ATS, Both were one-offs in the truest sense of the word. In 1978, he saw a short mid-season fling in the second Ensign go to waste, which came to an early halt when he did not survive prequalifying at Monza. At the same event he then jumped ship to the German-language ATS team where team boss Schmid had been firing employees again. Harald could take the second HS1, thank you very much, as lead driver Jochen Mass had put himself out of action in a pre-Monza test just days before. It still did not secure Ertl business on Sunday as he failed to qualify. Still, he beat young Bleekemolen - now suddenly promoted to team leader - by half a second. Two years later he was suddenly picked up by Schmid again to debut the team's second D4 chassis - or FW07 lookalike, if you will. This time, Harald was well off the pace and showed a clear form of single-seater rust, although his first steps into motorsport had been in monocoques (F Vee, Super Vee and F3). As a leading contender in the Group 5 series, which came to visit Hockenheim more than often, the Austrian's No.10 drive was a guesting appearance pur sang - the ATS team, which had gone through the season focusing on Marc Surer, turning their home GP into a special occasion with two D4s and a respected "home" driver, as Ertl drove under a German license. With Harald being three seconds off Keegan in the private RAM FW07, the guest drive ended on a Saturday - as did most of Ertl's Grand Prix weekends. Austrian born Harald Ertl was basically a motoring journalist with a great passion for racing. So he was considered as being an amateur racer in the first place. Harald's racing days started in 1971 when he got into the Formula V and Super V class, turning to the German F3 championship in 1972. His biggest success before he got to race F1 cars was winning the 1973 Tourist Trophy at the side of Derek Bell. Later Harald gathered enough money from sponsors to start racing in F1 in 1975 with the Hesketh team, staying with that team for 3 seasons, but without much success. In 1978 he made a move to the teams Ensign and ATS. Only with the Ensign car he could make it to the starting grid twice (Germany and Austria 1978). The other races he was not able to get through the pre-qualifying or qualifying rounds. The last race he actually finished was the Swedish Grand Prix in 1977, when he finished 16th. The reason for this photo of Harald Ertl and Marc Surer's cars is the following. At first it was the last race that Harald got into an F1 race, but he failed to get to the starting grid. The second reason was that this was the first time in the 1980 season that ATS ran two D4 type cars during the same race. Before that they only ran two ATS D3 cars during the first two races of the season (Marc Surer and Jan Lammers) and in South Africa Surer ran the D4 and Lammers the D3 car. Between the USA-West and British Grands Prix ATS only ran one car during five races. Jan Lammers drove the D4 three times and Marc Surer two times. Germany saw the return of two ATS cars, but only for this race. After the German GP and until the end of the season Marc Surer was the only entry for the ATS team again. Marc Surer is one of the most successful racing drivers from Switzerland for a long time. Marc started as a racing driver being picked up by the BMW Junior touring car team in the middle part of the 70s. He made his debut in F1 in the 1979 season for the Ensign team. 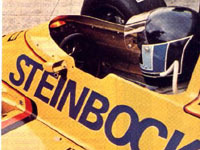 In the 1980 season he brokes both his ankles during a practice crash at the Kyalami track. This got Jan Lammers the task to drive alone for the ATS team until the Germany race. There he was replaced again by Surer who teamed up with Harald Ertl. In 1981 Marc did races for the Ensign and Theodore teams. Between 1982-1984 he drove for the Arrows team. During this period he got hurt once again. This time he got leg injuries after another testing crash at Kyalami. During 1985 he rejoined the BMW company when they supplied the engines for the Brabham team. Marc only stayed at Brabham one year and rejoined Arrows in 1986 and with this he closed his active F1 time. He tried one rally with the Ford RS200 car in Germany. But during that rally he crashed, which killed his co-driver and left Marc with serious burn injuries. Since then he has occupied himself as a television commentator, managing his wife Yolande in her F3 career and, more recently, he has taken over as manager of the BMW racing programme in the German Touring Car Championship.